Touch magic, pass it on. I am delighted to announce the arrival of Awakened and Other Enchanted Tales, my collection of fantasy short stories, in print and e-book form! This is a project that’s near and dear to my heart–I’ve actually wanted to do this for some time, but I knew that a) I’d have to fit it in between books, and b) I’d have to educate myself about self-publishing because I’d be releasing it independently. But this spring, all the pieces came together–almost magically. That it happened around the time that the new film version of Cinderella came out is even more serendipitous! My love of fairy tales stretches back to childhood, when they–along with the works of Beatrix Potter and Dr. Seuss–were among the first things I learned to read or had read to me. A few years later, I was devouring Andrew Lang’s colored Fairy Tale books and scouring library shelves for more books like them: Perrault, Grimm, Andersen (whose penchant for tragic endings came as something of a shock to me), their various imitators and innovators. I remember an ancient collection called Tales Told Again by Walter de la Mare that was one of my favorite reads when I was eight or nine. But it wasn’t until about a year or so later that I discovered the delights of the wholly original fairy tale, as practiced by Nicholas Stuart Gray (Mainly in Moonlight), Barbara Leonie Picard (The Faun and the Woodcutter’s Daughter), and Jane Yolen (The Girl Who Cried Flowers). I dedicated Awakened to this trio of authors, who are as interesting as their stories. Intriguingly, they came to writing fantasy almost as an afterthought–Gray started out as an actor/playwright; Picard began writing fairy tales to keep her spirits up while on fire-watch in England during WWII; and Yolen still considered herself more of a poet and journalist when she published her first children’s book. What all three seemed to have in common was a love for the kind of stories they told and a complete lack of self-consciousness or embarrassment about it: “Yes, I write fairy tales, and I don’t have a problem with it. Do you?” Which is perhaps the healthiest attitude any author can have when it comes to his or her own stuff! Something else these authors share is versatility. Their tales can be dark, atmospheric, satirical, or humorous, with endings that range from triumphant to ambiguous to tragic. But for the duration of each story, the reader is transported Elsewhere, caught up in vitally important matters of Dark and Light, and sent down familiar paths that can turn and twist in startling new directions when one least expects it. That experience is what I have worked to recapture in this collection. (The title story–as many of you may have guessed–is a variation on Sleeping Beauty: a What-If? scenario that begins after the spell has been broken.) And while not every tale concludes with a conventional “happy ever after,” I hope readers will agree that the characters, by and large, receive the endings that they deserve. Although Awakened represents a new direction for me as an author, rest assured that I am not abandoning romance! I have included an excerpt from A Scandal in Newport, a future novella starring Thomas Sheridan and Amy Newbold from Waltz with a Stranger. And I recently finished Devices and Desires, the first book in a new historical series. More details will be forthcoming, on this site and in my quarterly newsletter, for which you can sign up here at pamelasherwood.com. Readers, what is your favorite fairy tale or work of fantasy? I will be giving away a signed copy of Awakened to one commenter this week, until midnight PST on April 13. Thank you all for your interest in my books! 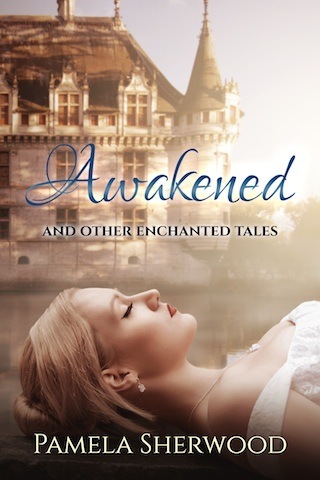 ETA: MarleneW wins the giveaway for Awakened and Other Enchanted Tales! Please send me your contact information and I’ll get the book in the mail to you ASAP. Thanks again!